Since it’s Valentine’s Day, you might be looking for a nickname for your sweetheart. I have the perfect suggestion. Sugarboo! It’s perfect. It has sweetness at the beginning and then a bit of Southerness at the end. I can just hear Dixie Carter saying it, can’t you? Thanks to Polly for this pic! 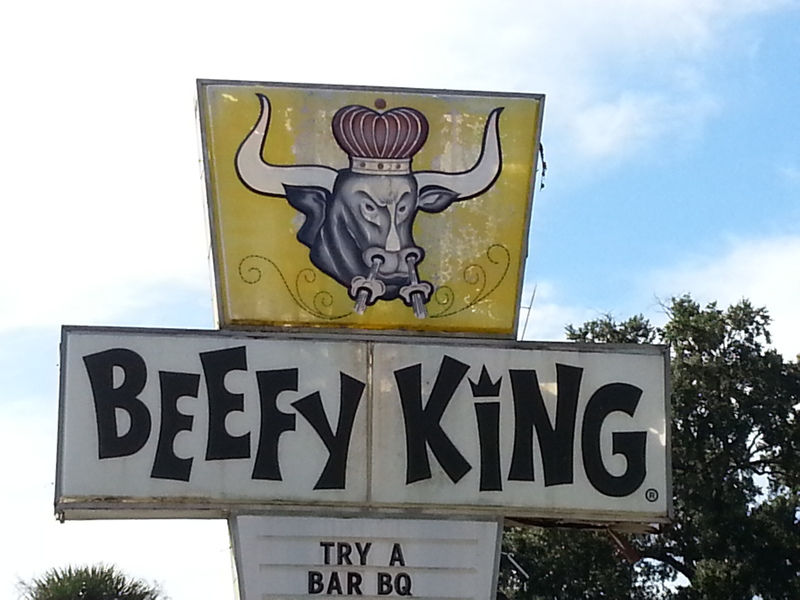 When you think of “fine quality bbq,” what image pops into your head? 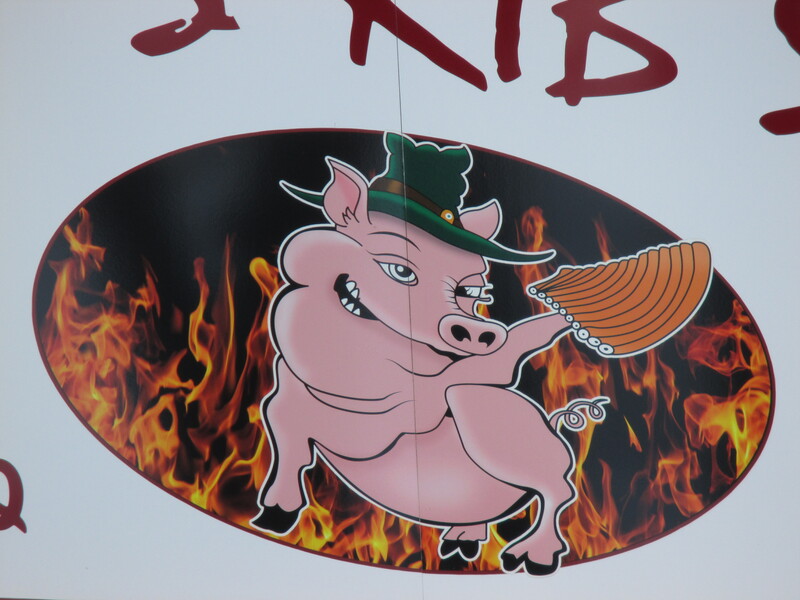 It’s a pig wearing a green hat and holding a rack of ribs, isn’t it? I knew it! I think we need a close-up shot of this fine fellow. 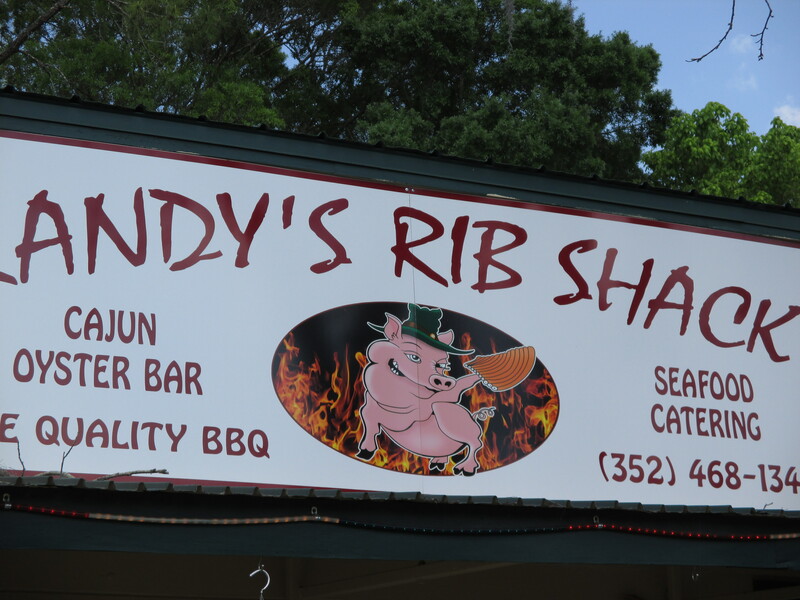 Randy’s Rib Shack is in Waldo, Florida, which is on the way to Gainesville if you’re coming from the north part of Florida. Y’ALL. I can’t EVEN. Words escape me. 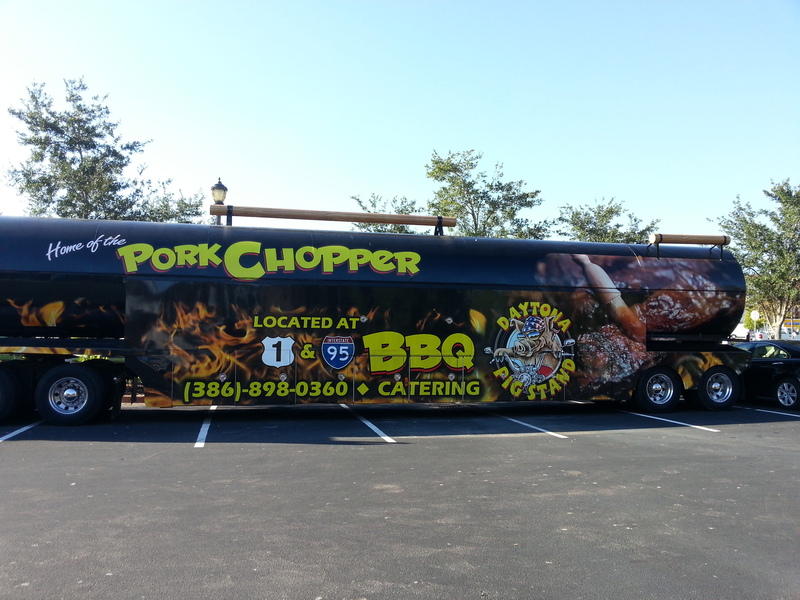 IT’S A GIANT BBQ ROASTER THING. 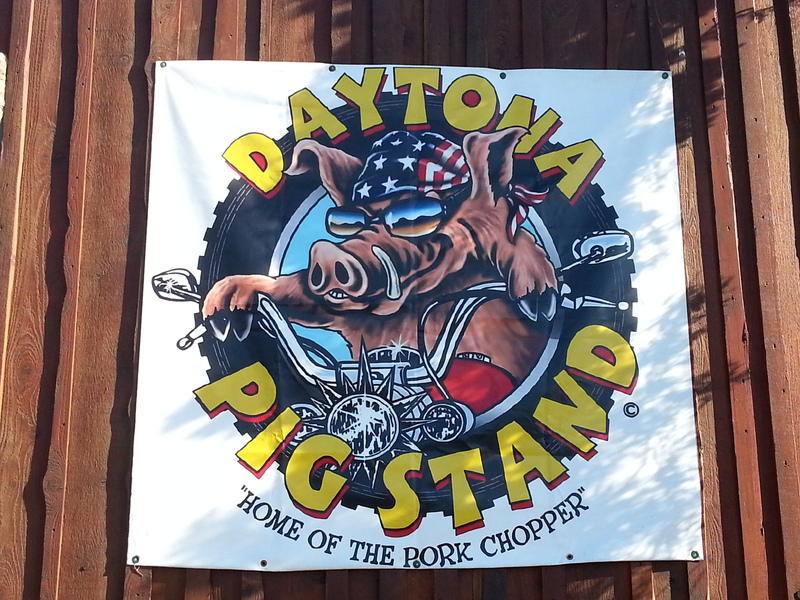 And a scary-looking hog. ON A HOG. 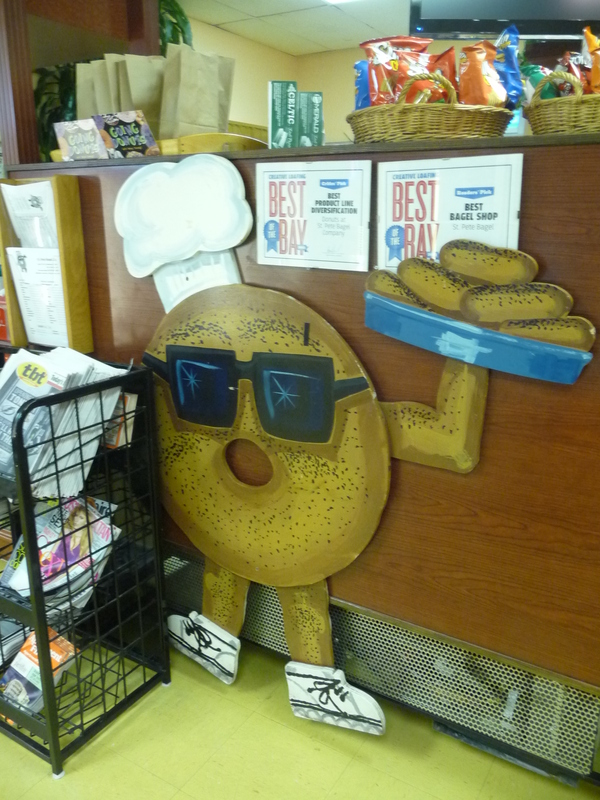 Swineless Sunday: I’ll Bring the Cream Cheese! 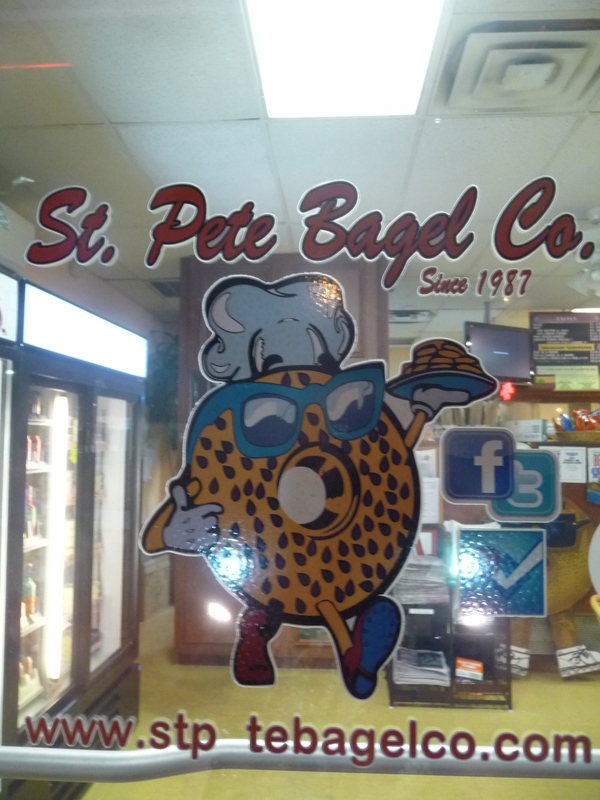 Andrea sent the pics of this carb-loaded character from St. Pete Bagel Co. in St. Petersburg, FL. Finally, a joke to end your weekend. What do vegetarian zombies eat? Graaaaaains! It’s well stocked. Just don’t ask them to help you get any items off the top shelves. 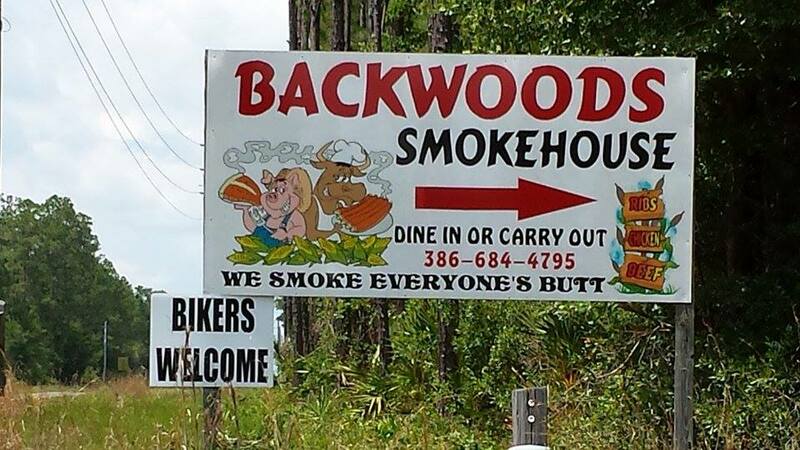 The name makes more sense when you know where the store is located, though. This fellow is hanging out in front of the row of stores. 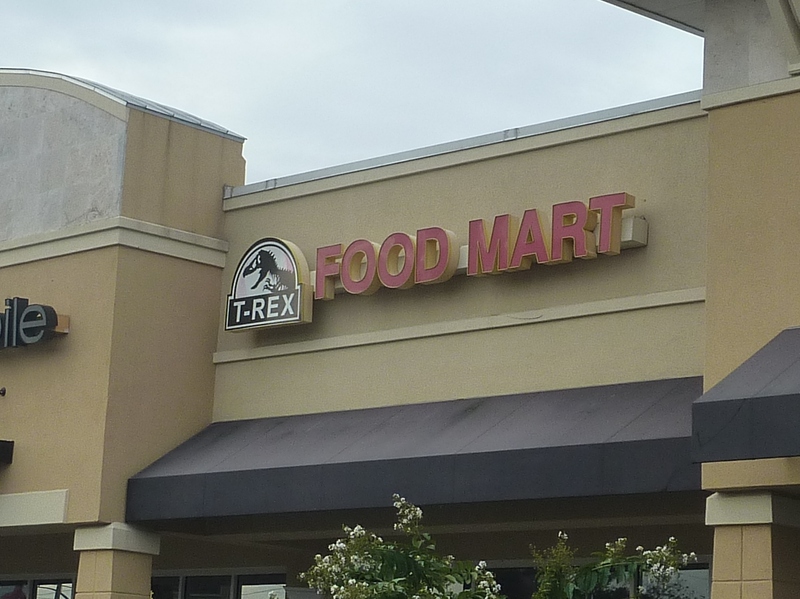 I read here that the dino used to guard a mini golf place, but when it went out of business he spent a few years just hanging out before being moved to the shopping center on Beach Boulevard and inspiring the food mart’s name. 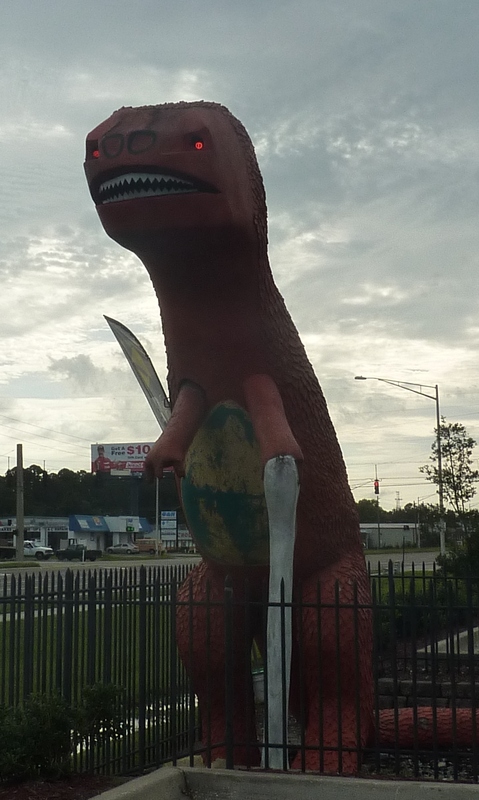 For his age (70 million years, give or take a few million), he looks pretty good, but I think a new paint job will soon be in order. What color combos would you suggest? Tell us in the comments! Happy Labor Day weekend! 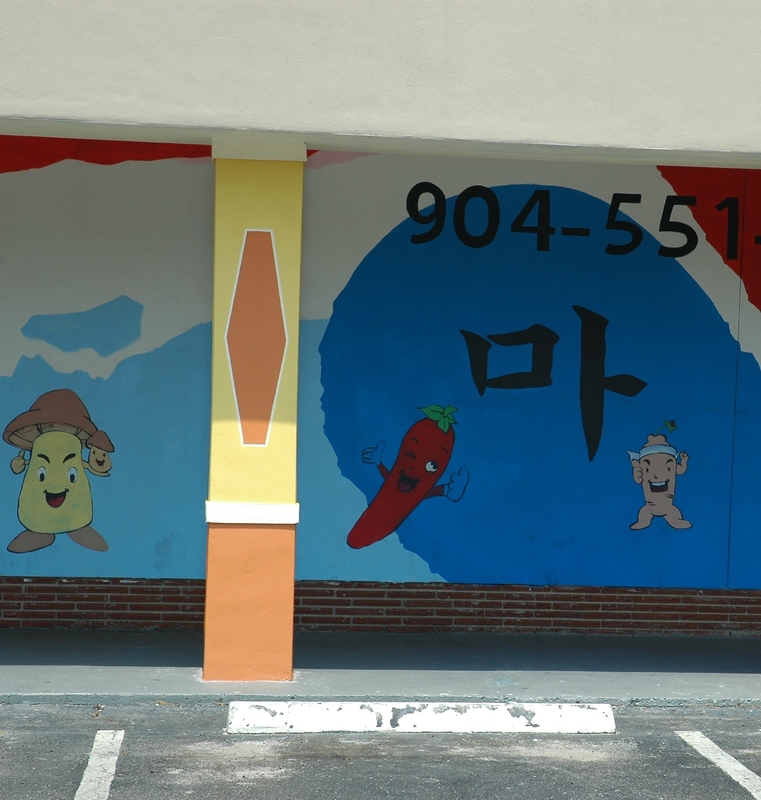 Let’s celebrate by enjoying this mural outside an Asian market in Jacksonville, FL. No animals in this one: just cheerful, thumbs-up veggies and fruits. Any idea what the veggie on the right is in this first pic? Husband says daikon, I say ginger. 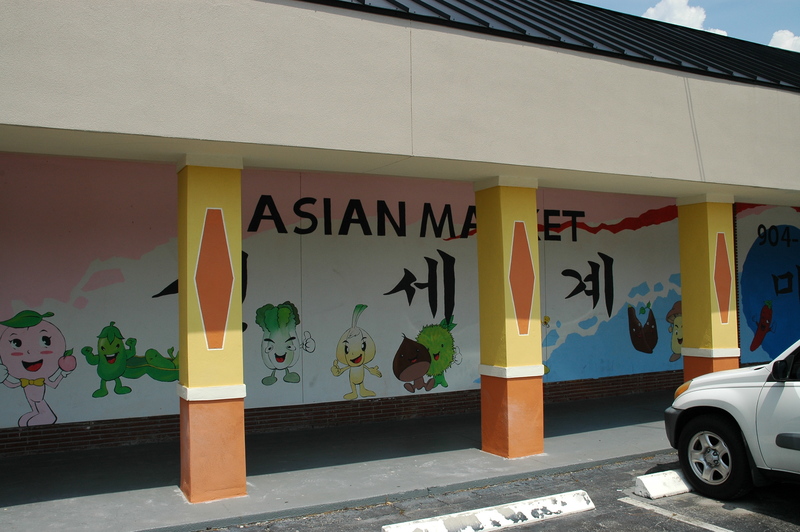 This second pic should give you an idea of how large the mural actually is: at least five cars wide. Does anyone have a guess as to what the prickly green thing is? 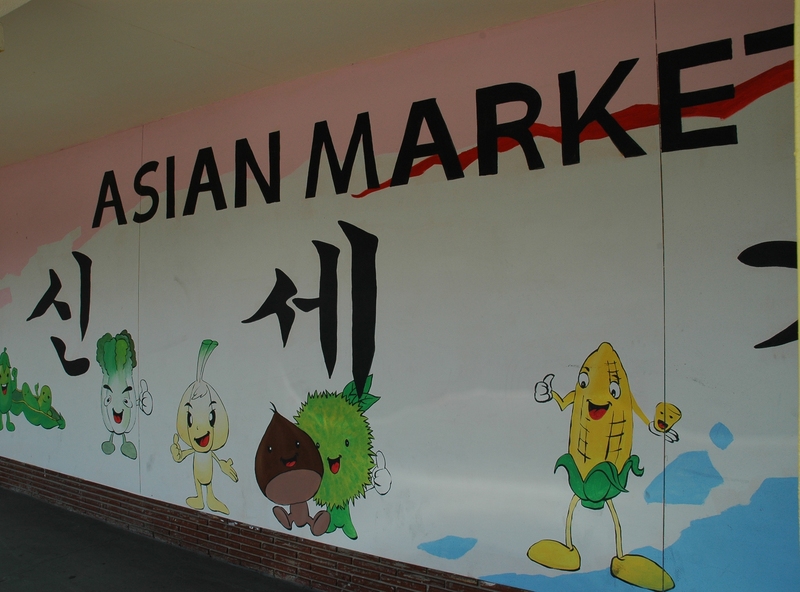 It looks too round to be a durian (but then again, these are grinning cartoon produce so I suppose I can’t expect too much in the way of realism). 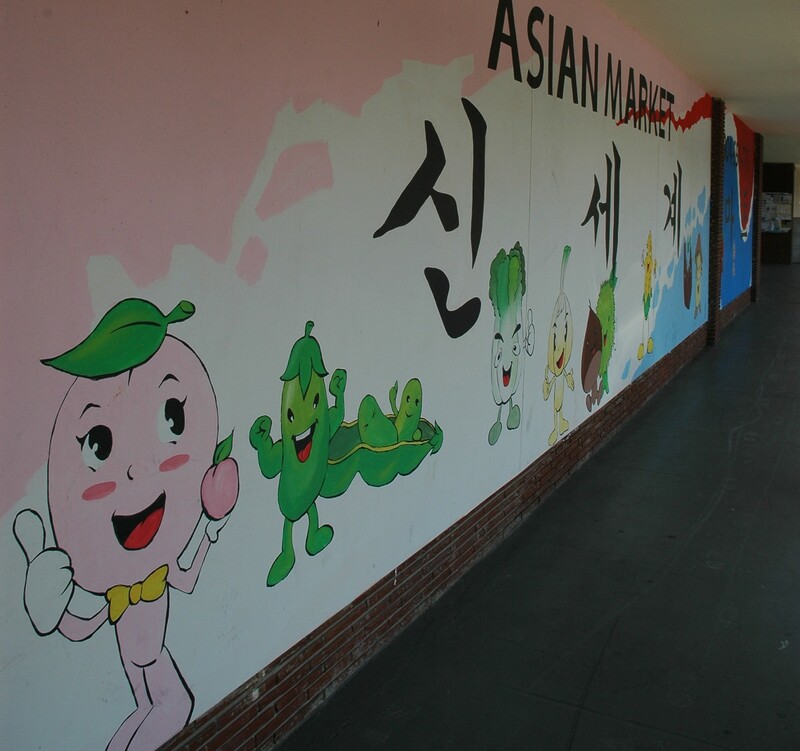 A close-up of the left side of the mural. I love that the bean is showing off his muscles. Plant protein power, baby! 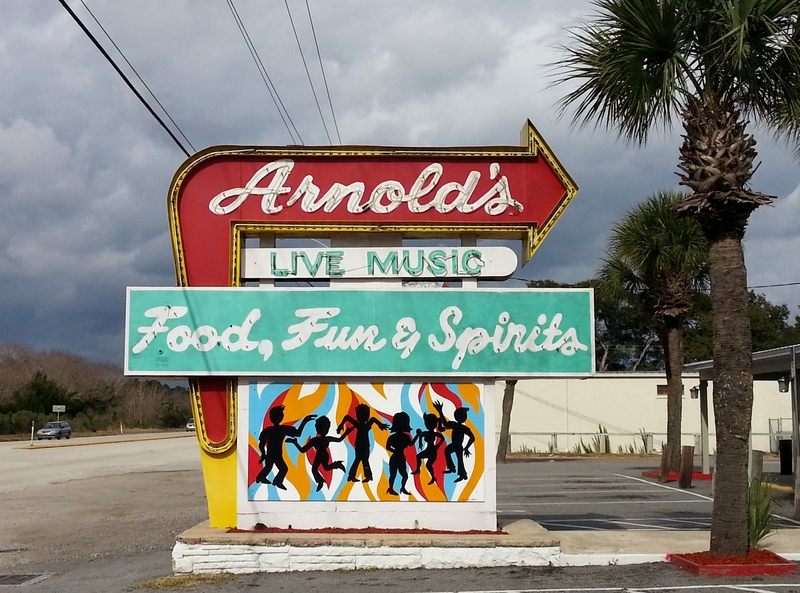 If you have any pics of signs that don’t feature animals but that are still blog-worthy in some way, send them to me! 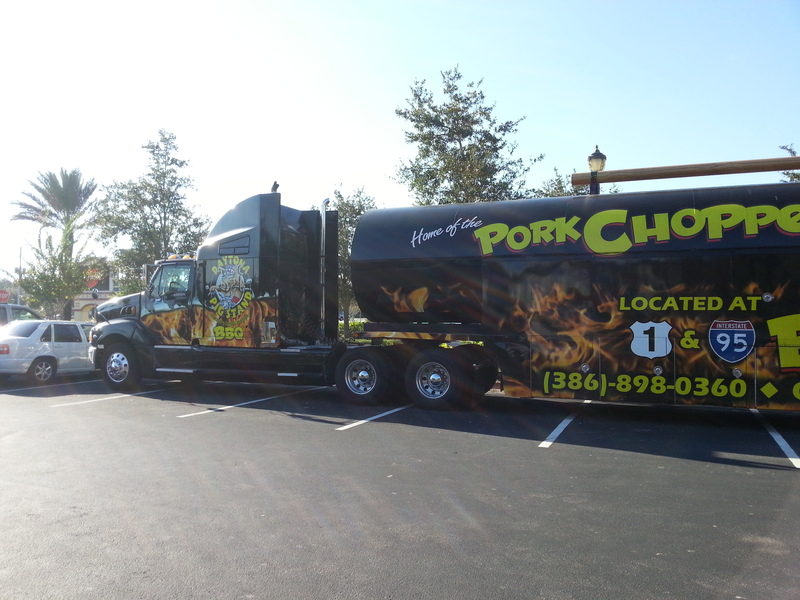 I’d love to make “Swineless Sunday” a more regular feature!